Farrier, horseman, cowboy and foxhunter William E. “Billy” Streaker died on August 10 at the age of 82 from complications related to liposarcoma. Billy was a horseman’s horseman. Didn’t matter the hat, the boots, the saddle or the reins. Billy was a cowboy; he could rope, rein – do it all – and he did, including several years of riding out west, after farrier school at California Polytech, riding through Nevada and California with best pal and future legendary trainer Ray Hunt, and he continued to ranch out west, even after he returned to Maryland. Billy was a foxhunter, grew up hunting with the Howard County Hounds, whipped-in and eventually hunted all over the mid-Atlantic. Billy also showed Arabians and Appaloosas. He rode timber and hurdle races. He drove. He bred and trained Thoroughbred racehorses. He held trainer licenses (flat track) in six states. After the track, Billy made them into field hunters and show horses. And through it all, he shod. A blacksmith like his grandfathers, John R. Streaker and William Edward Isaacs, Billy shod horses all over the state of Maryland – and eventually all over the country, for clients loyal to him for decades. He shod for Maryland’s most famous breeding stables, including Al Marah (Arabians), Yankeeland (Standardbreds), and Glade Valley (Thoroughbreds). Married four times, Billy raised seven children (including farrier Tim Streaker). Billy was very close with older brother Howard (who passed away this past June), and the pair took over the family dairy and crop farm, converting it to horses, and residing side-by-side during the years Billy lived in Maryland. Shires, Percherons, ponies, Appaloosas, crossbreds on Howard’s side, Thoroughbreds on Billy’s side. Howard’s kids on one side, Billy’s kids on the other. Billy Streaker will continue to touch horses through the numerous farriers he mentored. 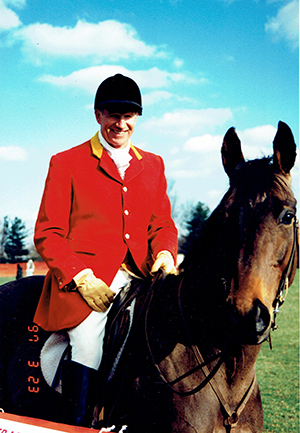 In the February 2003 Equiery, Hope Holland wrote: “if the shoe fits, chances are Billy Streaker put it on the horse, or trained someone who did.” That was the year the Maryland Horse Council recognized Billy Streaker as the “Horseman of the Year” for his outstanding and influential career in the Maryland horse industry.